It’s time to get back to the babies here at Small Potatoes. I promised I’d be bringing more baby posts, so here you go. But I have to say, this activity was almost a giant fail. For real. Babies learn through touching everything. They also learn by tasting everything. So I have been wracking my brain to come up with baby-safe sensory play ideas for the 2 boys in my care. I have seen plenty of posts out there for playing with jello, and I figured they were on to something. Jello is pretty and inviting. It’s tasty. It smells good. And completely baby-safe. I figured I’d make a bowl of it for the babies to play in. How hard could it be? Well, my jello didn’t set. I waited. I waited some more. It still didn’t set. I put it in the freezer to cool it faster. I got nothin’. Sigh. I had babies waking up from naps soon and I had nothin’. I didn’t want to throw it out, so I nosed around in my pantry for a solution and I came upon my jar of minute tapioca. Hmmm…YES! I poured the unset jelly into a saucepan, dumped what I thought was a “good” amount of tapioca into it and brought it to a boil. It started to thicken. YAY! I poured it back into the play bowl and let it cool. The result was better than I had imagined. And WAY better than plain old jelly. You could actually pick this stuff up in your hands… It was pretty darn cool. Slime that is still edible. It was like winning the lottery! 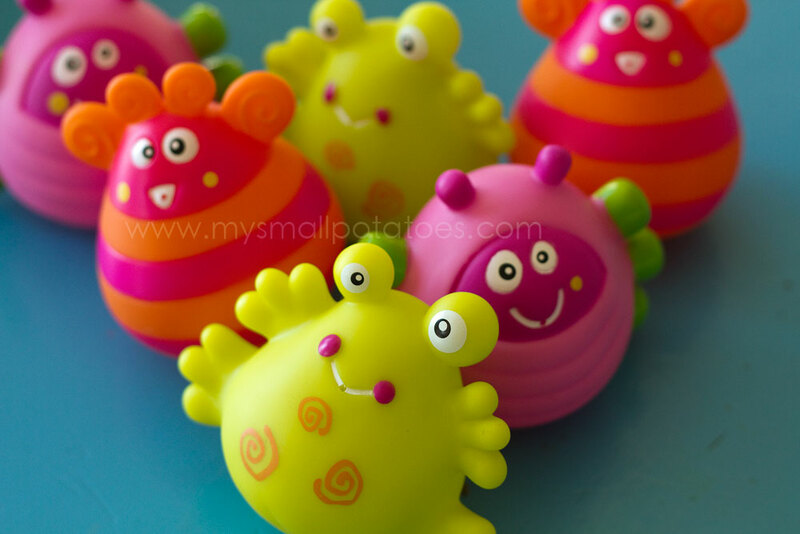 I gathered up some baby monster toys, as I figured slime lends itself so nicely to monster play! 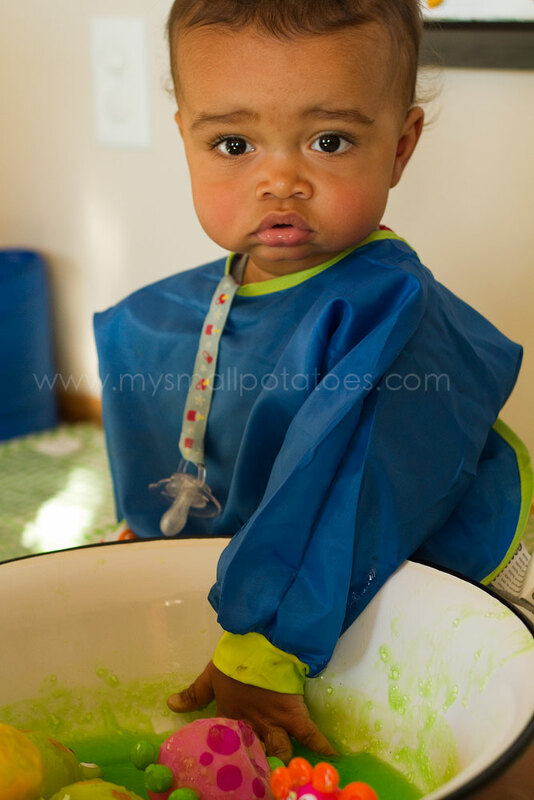 I added a measuring scoop and some plastic measuring spoons for fine-motor practice… I put smocks on the babies and set them in front of the bowl. It was interesting to watch the two different approaches the two babies had to this activity. Baby S approached the slime bowl full speed ahead. He was grabbing handfuls and spreading it out on the mat beside him… He had both hands in there, pouring, stirring, and smacking. And did he eat it? Yes he did. And loved every second of it… The toddlers had a go with this activity and loved it. The school aged-kids played in it when they returned from school. All around, my almost-fail-jelly-bowl-turned-slime-bowl was a success. Now you want to know how I cleaned it up. Because yes…it’s super sticky. I had a bowl of water for each child who played in the slime. They sat in front of their bowls and cleaned themselves. I am a strong believer that clean-up should be part of the play process whenever possible… Once everyone had washed and dried, I threw the smocks into the washing machine, and washed the splash mat with a warm cloth. The bowl of slime dissolved in hot water in the sink and poured down the drain. I will say though, that the bits of tapioca that had dried on the side of the bowl were stubborn, so maybe try to wash the bowl before the bits have a chance to dry up. Next time something goes wrong, don’t give up. You know the saying…when life gives you unset jello…make slime! Fabulous idea – I see slime time coming to our kitchen very soon! Yes!!! Bugs would be a perfect match! Enjoy! Cant wait to try this…. P.s i want thems baaaaaabies!! Aren’t they just delicious!!!??? I soooo wish you were my neighbor!!! Oh, the baby snugs we would have!! That is awesome! I hate it when the kids get sticky and messy but this actually makes me want to get down and dirty! Love it! I would change one thing. I like to use edible stuff with the littlest ones too, but I prefer that it not taste so good that they WANT to eat it. So I’d use Knox unflavored gelatin, clear or with a few drops of food color. On a similar vein, I once used whipped cream- but I whipped it up myself from a pint of cream, and added no sugar. I have even considered experimenting with small amounts of spices to add a bitter taste.